Shahr-e-Aftab (Exhibiran International) is Iran’s latest and biggest exhibition center. 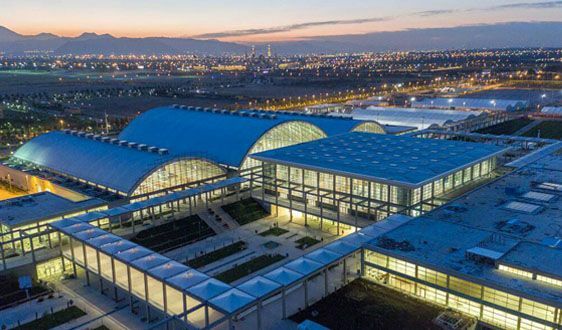 Conveniently located between Tehran City and the international airport with access to several highways and public transportation connections, it offers 50,000 sqm of exhibit space in 16 halls with the latest technical equipment. The central location also allows visitors from neighboring states such as Iraq, Afghanistan, Turkmenistan and Tajikistan, which have traditionally maintained close commercial ties with Iran, to visit the exhibition. The permanent roofed exhibition constructions including 3 halls with a total area of 25000 square meters. The temporary exhibition places (frame-tents) with a total area of approximate 28000 square meters which will be replaced by permanent constructions in next phases. The Nations Hall with more than 7000 square meter area. The administrative space with 24000 square meters in two floors. Several parking lots of the exhibition area along with the extra parking lots in Imam Khomeini Holy shrine with the total capacity of 11,000 cars.